Show your enthusiasm for a young hoopster’s budding career with this boy basketball ornament personalized to make him smile! 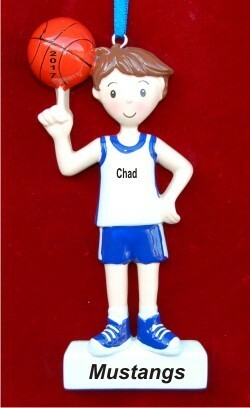 The basketball swish boy personalized Christmas ornament depicts a cool dude casually spinning the ball on his finger dressed in his hooping best. There’s a matching girls basketball personalized ornament too, and we have many other personalized basketball ornaments with different hair and skin tones, uniform colors and more, so finding hoops ornaments for all the All-Stars on your list is fun and easy. Our custom velvet gift bag is included when you order the brunette boy basketball personalized ornament from Russell Rhodes. Christmas Gift Dec 31, 2017 Sarah S.